Here’s a radical idea: Let’s help make Reno a vibrant, modern city. A city of optimism and wonder, of originality, sustainability, and surprise. Let’s start here. Skyline View looking North across the Truckee River from Barbara Bennett Park. Slide to see current and proposed final phases of project. We’re building the West 2nd District one common-sense piece at a time, as the market allows, as the community desires, minimizing risks and maximizing transparency. So, rather than fretting the project’s complexity, why not take a deep, optimistic breath and join us on this historic journey? Because West 2nd is more than a place, it’s a community process. The West 2nd District mindfully integrates with, and reactivates, its surrounding historical and architectural environs. 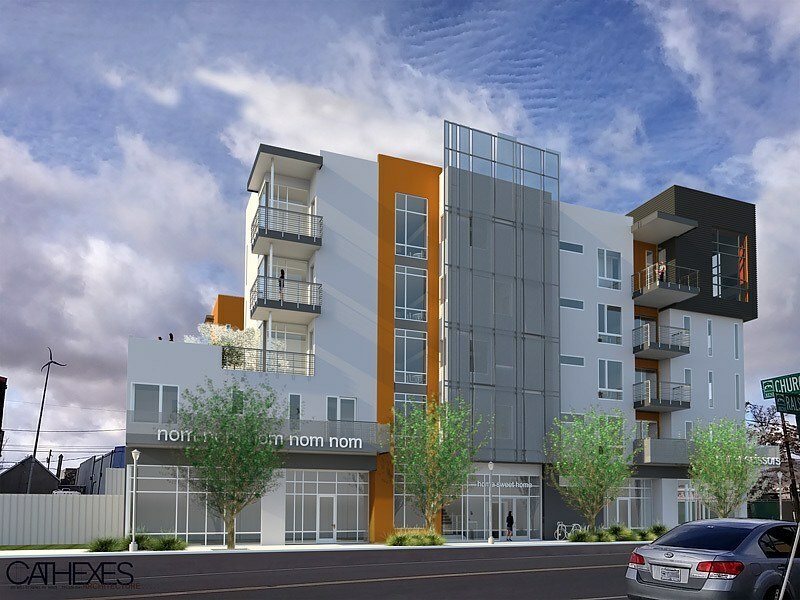 The approximately 17-acre neighborhood is planned along the Truckee River on the west side of Reno’s downtown. 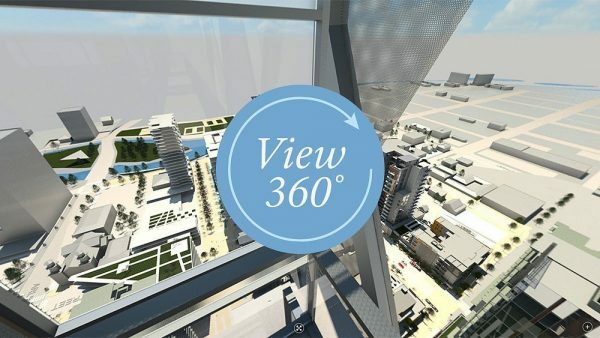 Skyroom Level – This view taken from the Observation and Skyroom Level of the new ‘Tallest Building in Reno’ gives the viewer the experience of seeing the West 2nd District and surrounding Downtown Reno area from 482 feet. 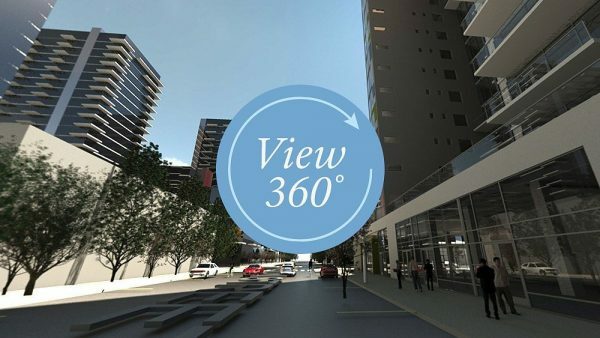 Ralston Street View – Interactive Panoramic view at street level showing the proposed Ralston Street design. A daydream moment under a tree. A picnic on the grass. A chance meeting with an old friend. These are just some of the gifts of great public spaces, spaces that encourage and reward the meandering discovery of one’s community and one’s own ideas. Through an expansive new urban park and pedestrian-only streets, the West 2nd District invites people to wander, wonder, and enjoy life at human speed. These tree-lined paseos are populated by ambitious public art, extraordinary restaurants, cafés, retail spaces, and the beehive hubbub of daily urban happenings. To call the West 2nd District home is to be part of a heartwarming metropolitan renaissance. The birth of a new age in Reno residential design. An era of light and color and sophistication. These are residences that inspire and reward, that punctuate the poetry of daily life with elegance, efficiency, and wonder. Graceful, modern expressions of what a home can truly mean. And, by transcending the boundaries of age and income, West 2nd District is making this vibrant new aesthetic readily accessible to all. The residences at 235 Ralston Street is the first building of the West 2nd District. 28 condominiums with two retail commercial spaces on the ground floor. For those about to thrive. It’s time for Reno to expect more from it’s business spaces. It’s also time they got it. That’s the promise of the West 2nd District. 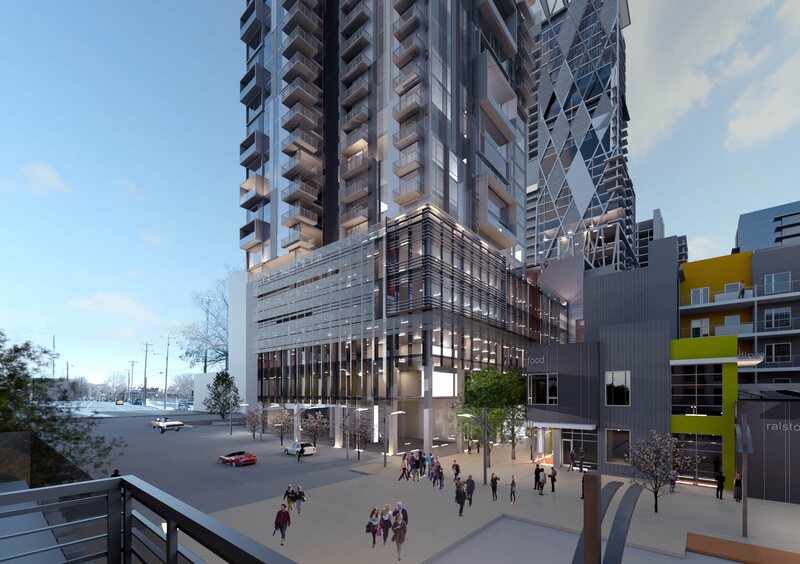 Through mindful design and unblinking ideals, we’ve set the bar high, big-city high, to create the kind of top-tier commerce center Reno needs and deserves. From street level to the boardroom, these are ambitious, no-expense-spared spaces appointed with every imaginable comfort, convenience, and technological edge. Spaces where enterprises of all sizes can create bold, new contexts for relevance and success. 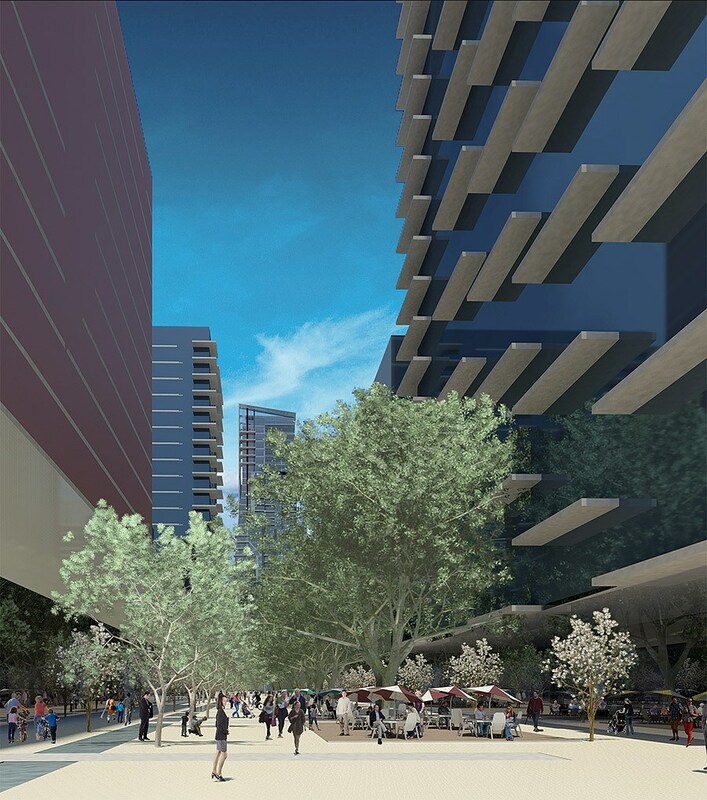 Looking North up the new Stevenson Paseo, showing the transformation of Stevenson Street to an energetic mix of outdoor dining, shopping and family activities.